The best part of ordering Chinese food is the meal-ending crack of the fortune cookie. 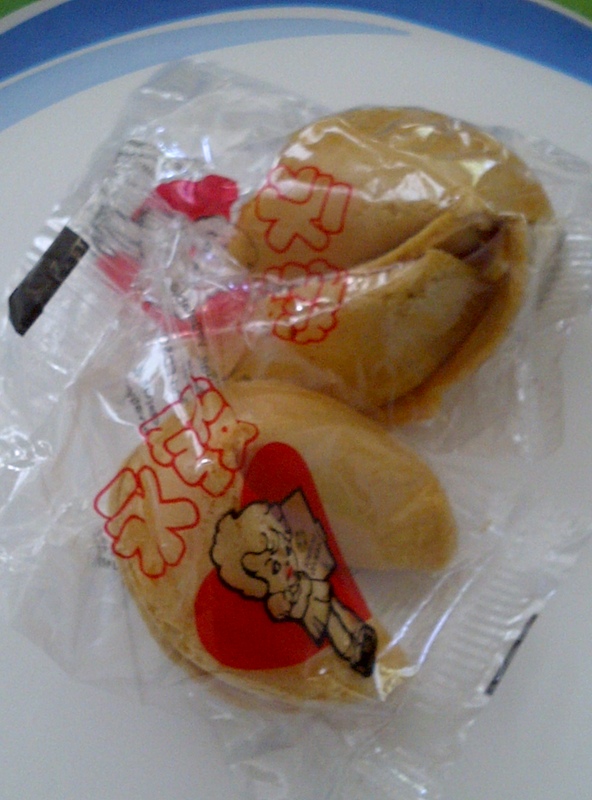 It is exciting to see what little bit of wisdom is held in a crisp cashew shaped cookie, and they are tasty as well. However, lately, I have been disappointed in the quality of the fortunes found in the fortune cookies. When I open that cookie, I want to hear something positive, something full of ancient wisdom, or something that I might hear from a palm reader. 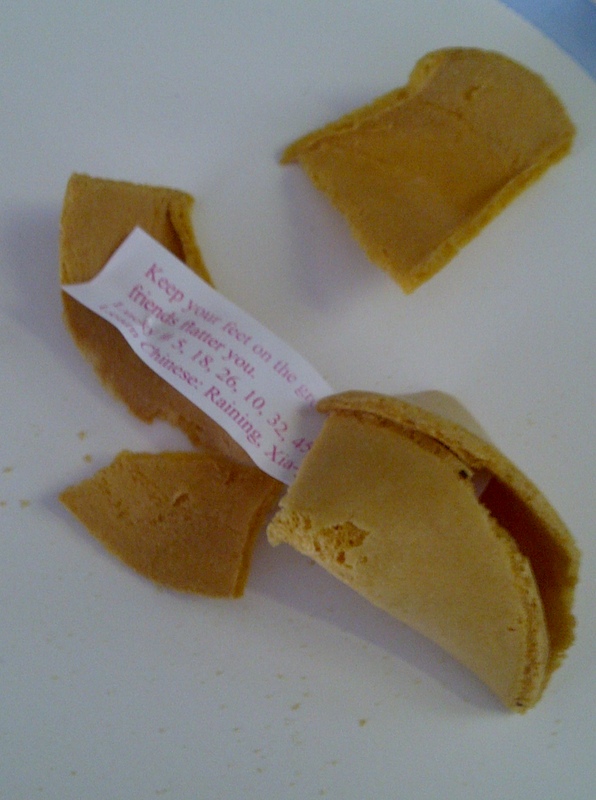 Since fortune cookies were introduced and created in the United States, the fortunes inside used to be based on proverbs, Bible verses, and English versions of Confucius Teachings. Somewhere I think these wise little notes have gotten lost. I do not think people want condescending words or nonsense in their cookies. Maybe the fortune cookie companies need to get back to basics and hire more competent fortune writers. After all, people like me who order Chinese Food depend on this knowledge! “You have a quiet and unobtrusive nature.” Huh? That is not a fortune. This is not even me! “Help, I am a prisoner in a Chinese Bakery!” Really? I am sending the Calvary to free you, now! “Eating causes obesity.” Thanks. I’ll just stop eating now, Dr. Oz. “You love Chinese Food.” Duh! “The golden egg of opportunity falls into your lap this month.” Whoo-hoo! “If your desires are not extravagant, they will be granted.” Is desiring a clothes-shopping trip on Rodeo Drive too extravagant? “An admirer is hiding his or her intentions toward you.” Provided that my admirer is not a stalker, this could be good. If you are feeling discouraged and disheartened by your fortune cookie, please feel free to comment. All comments will be forwarded to the worker who is trapped in the fortune cookie bakery for a speedy review. Fortune: You will read of a light haired woman who will make you laugh. Posted in Living the Life and tagged chinese bakery, Chinese Food, confucius teachings, food, Fortune Cookies, Fortune Cookies for a Better Fortune, funny, Grandmother Musings, humor, Living the Life, postaday, restaurants, writing. Bookmark the permalink. Now THIS is something I can relate to, haha! It’s funny and entertaining, but also true. In fact, just a few days ago I ordered Chinese food from this place about ten minutes away from my house. As always, I was both excited and skeptical to read my fortune at the end of the meal. Do you know what it said? “Today, you will interact jovially with those closest to you”. My sister was literally sitting across the table from me and let me tell you, we did interact jovially…about how ridiculously hilarious that fortune was! Come to think of it, maybe there was something to it after all :P.
Hahaha – did you really get “help I’m a prisoner in a Chinese bakery”? That is hilarious. I’ve had some over the years that weren’t actually fortunes, just statements, like “Tomorrow is a another day”. Whoopeee. Nicole, I really did get the prisoner fortune. We always order Chinese food for my birthday, and all the family was over. We laughed so hard at that one! I am sorry to hear about your grandmother’s passing. My condolences to you and your family. Thank you for the condolensces. It’s been about a month since she passed away. Even though I’m an adult, it feels weird that I no longer have any living grandparents. Oh, I bet that fortune made you laugh all day! Hey, it makes a great story. I just noticed that your posts are shared on Linkedin. Do you have a profile and do you mind if I send you an invite to connect? So, how does a person get the job of writing fortune cookie fortunes? I wonder if it is a short term contract or do you have to come up with new and profound fortunes month after month? Does this position require a degree in English – obviously not although I don’t think I’ve ever seen grammar mistakes. Maybe it should require a degree in philosophy. I would enjoy hearing words of wisdom or notable quotes but then they would have to call them notable quotes cookies – doesn’t sound quite right. Words of wisdom cookies not much better. “Looking for a person with a philosophical mind, who can write in short succinct sentences.